Dan Hogan Fitness: September is the best time of year to get started! September is the best time of year to get started! Every January, the fitness business sees a big bump as people make their New Year’s resolutions. Then, predictably, the new folks disappear by mid-February. By June, things slow to the summer snail's pace. Heck, my workouts had slowed quite a bit too, along with all of my Facebook and blog posts! Well, it's time to get going again -- time to get back on that horse. In fact, September is the best time of the year to push your fitness to the next level, not January! Think about the summer of 2012. Remember the trips to the beach, afternoons by the pool, and the big trips that had been planned for months. Did you look and feel as good as you could have for all of that? Some of you were in a wedding or two in that time. Did those wedding photos turn out as nice as you had liked? Take a quick look at those photos -- those digital photos that will never fade or tear or get creased. They'll be in the same condition 50 years from now as they are now. Did you look and feel as good as you wanted? Well, the summer of 2012 is in the books. It's behind us. But... All of this happens all over again in the summer of 2013. This is your inspiration for the coming months! September & October: Revise your current routine based on your new inspiration and then commit to it! 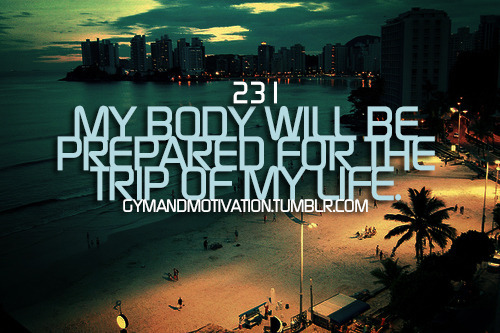 Take a couple of months to get your body used to following it and to make sure it fits into your schedule. November & December: Maintain your new routine the best you can through the stress (and eating) of the holidays. January: Get back into the routine after the stress of the holidays is behind you. This will be much easier if you start in September and not January. It will be easier to dodge the New Year's resolutioners for the short time that they crowd the gym. And, this time you'll know that you'll outlast them! February through April: Get 3 solid months of steady improvement toward your goals as the weather slowly improves. May & Beyond: Keep the momentum going into and through the summer. And, more importantly, enjoy the warm weather in The New You! You have 265 days until Memorial Day 2013. Starting now will let you start next summer looking and feeling your best!